Norwich, with all the facilities of a major commercial and thriving cultural center, is a friendly and easy-going place to live, and despite its medieval architecture, the city has a vibrant and youthful outlook. Located near England’s southeast coast, it is only 80 miles from London and a short flight or fast ferry/train ride from Amsterdam. The city offers many cultural amenities but is also close to the sea and to wooded parks for those who prefer the beautiful English countryside. Hobart and William Smith Colleges maintain an affiliation with the University of East Anglia (UEA) in Norwich, England. UEA has a student population of 14,000, with approximately 2,500 international students drawn from 100 nations around the world. The university is ranked among Britain’s finest academic institutions. HWS students have the opportunity to study at UEA, taking classes and living alongside their British and international classmates, for a full cultural immersion experience. Students who participate in this program can select courses from a variety of departments, including but not limited to: humanities, American Studies, media/communications, the sciences (biology, chemistry, psychology, geoscience), mathematics and computer science, and the performing arts (drama, music, film). The standard course load is comprised of three UEA course modules, for which students will receive 4 HWS credits. Two of the course modules are normally in the student’s major field with the other being in an elective area. All courses are taught by University of East Anglia faculty. For specific information about courses and the program, please consult the UEA website for international students here or stop by the CGE. Due to the wide range of courses offered through UEA, this program can accommodate students from a variety of disciplines. It will be of particular interest to those studying the sciences, mathematics, computer science, media and society, American Studies, writing, and the performing arts. This program is open to juniors and seniors in good academic and social standing with a minimum GPA of 3.0. Due to the challenging nature of study abroad, student academic and disciplinary records will be carefully screened. Note: due to the timing of the academic calendar at UEA, seniors participating in the spring semester will not be able to return in time for commencement on the HWS campus. 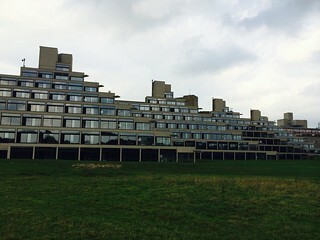 Students reside in residence halls administered by the University of East Anglia. A typical residence provides fully-furnished single rooms grouped around a shared kitchen. While students typically prepare their own meals, there are a number of places to get meals on campus as well. The Norwich program is not a “study abroad program” in the traditional sense in that HWS students will be directly enrolled at the university. While there will not be excursions designed specifically for HWS students, UEA does have a full-service student travel agency on its campus in order to assist those planning their own travel. In addition, the university has an extremely active student union and international student office which plan a variety of educational, cultural and travel opportunities in which all students are invited to participate (fees will vary). Independent and self-starting students will have a multitude of opportunities to immerse themselves in the local culture and to explore southeastern England and beyond. Students will be charged standard HWS tuition and fees and a $600 administrative fee. This will cover tuition for a four-course semester, health insurance, airport arrival services, and orientation program. Note that no room or board charge is included. Students will pay room fees directly to the University of East Anglia (note that several housing options are available at different price levels; housing expenses will be higher during the spring semester due to the longer term) and they should plan to bring their board fee to cover meal expenses throughout the program. While meal expenses will vary according to individual tastes, we estimate that $2000—$2300 should be sufficient for students who prepare their own meals (during the spring semester, students should plan on $2400—$2700 for meals due to the longer semester). Additional expenses not covered include airfare, books, visa (recommended) and personal expenses (laundry, entertainment, ground transportation and independent travel). We estimate airfare for this program at $900—$1000 from the East Coast, train fare to Norwich at $130, books at $250, and visa at $125. It is difficult to give an accurate estimate of student expenses because student spending habits differ considerably. We would suggest a minimum of $1,500 above and beyond meal and accommodation expenses. However, students on a tight budget should be able to manage with less. If you are concerned about finances, we strongly encourage you to talk to the CGE staff who can offer information and advice based on your specific situation.